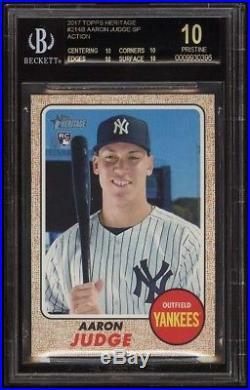 For sale is one of the hottest, most prestigious, and most highly-sought unofficial 1/1 relics of the latest can't-missed Triple Crown threat in Major League Baseball (MLB)--the "2017 Topps Heritage #214B Action Aaron Judge Short Print (SP)" Rookie Card (RC) of the one and only fast-becoming-legendary Aaron Judge, who has been hailed as the new face of the storied New York Yankees where he has drawn rave reviews and well-deserved comparisons to Future-Hall-of -Famer Derek Jeter and Cooperstown Icon Mickey Mantle! 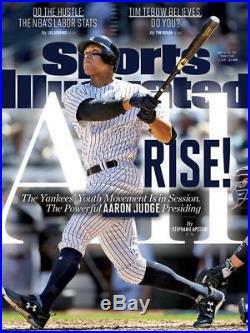 For the record, Judge owns the longest hit Home Run ever at 495 feet since ESPN (originally an initialism for Entertainment and Sports Programming Networks) began tracking in 2009 and holds the distinction of being one of only three Yankees (along with Joe DiMaggio and Joe Gordon) to have reached the 25-Homer mark in his rookie season having. S Yankee Rookie Home Run record of 29 set in 1936. In only the team's 83rd game of the season and then following up on this historical achievement by immediately eclipsing. Mark in the very next game with his 30th homer. 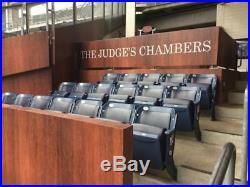 Indeed, Judge was selected as a starter in the 2017 MLB All-Star Game, where he not only patrolled the outfield for the American League (AL) but participated in the highly-anticipated Home Run Derby for the AL as well simultaneously, a showcase in which he lived up to the tremendous hype by blasting 4 home runs over 500 feet--one of which traveled an astonishing 513 feet, the farthest in the Derby--on route to being crown the Derby champion. In becoming the first ever rookie to win the Derby outright, MLB commissioner Rob Manfred was so impressed by Judge's historic performance that Manfred stated that Judge is a player "who can become the face of the game, " and rightfully so considering the sea of mammoth dingers that this young superstar has been launching in record pace which inspired the launching of the Judge's Chambers section at Yankee Stadium! Hence, it really is no surprise that this phenom has already graced the cover of the May 15, 2017 edition of Sports Illustrated and appeared on an episode of The Tonight Show Starring Jimmy Fallon! Most recently , at the top of the 5th inning in a night game against the Seattle Mariners on Friday, July 21, 2017, Judge was found guilty of hitting a bomb so hard that he broke Statcast all together as MLB's tracking technology cannot even measure the details on the long ball seeing that it nearly cleared Safeco Field entirely! 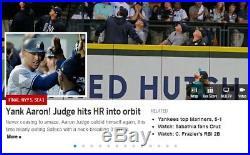 Judge then followed up this feat by slugging his 39th of the year against the Baltimore Orioles on Thursday, September 7, 2017 and in doing claims sole possession of second place for most home runs by a rookie in his debut season. As an icing on the cake, the 6-foot-7 Linden, California native capped off his remarkable rookie season by smashing the legendary Mark McGwire's MLB Rookie Home Run record of 49 on route to establishing a new mark of 52, cementing the place of "All Rise" among the all-time Yankee greats as only 5 players in Yankee history have ever reached the elusive 50 home run club--The Bambino, Mickey Mantle, Roger Maris, Alex Rodriguez, and now Judge--not to mention that Judge's 33 home runs at Yankee Stadium eclipsed The Sultan of Swat's previous record for the franchise set all the way back in 1921! 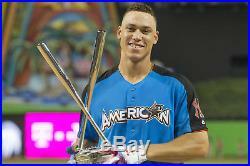 Needless to say, Judge is the odds on favorite to win the Rookie of the Year Award unanimously given that no rookies in MLB history have ever reached the half-century mark in home runs before Judge emerge onto the scene and reached stardom in the 2017 season! 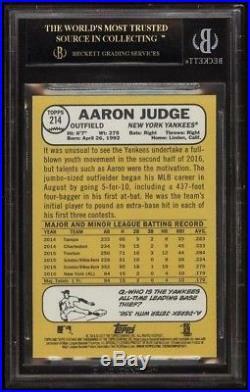 Even more unique is the fact that the BGS certification number for this card starts with Judge's infamous favorite jersey number No. 99 as it is 000 99 30396 , therefore truly making it a very special card! The item "2017 Topps Heritage #214B Action Aaron Judge SP RC BGS Black Label 10 Pristine" is in sale since Thursday, November 09, 2017. This item is in the category "Sports Mem, Cards & Fan Shop\Sports Trading Cards\Baseball Cards". The seller is "cmcdavid97" and is located in Ontario. This item can be shipped worldwide.